1909... Recently immigrated Germans and Czechs who have settled in the new town of Shiner bring many of their traditions and tastes with them to the New World. Still yearning for their classic Bavarian brews, they form the Shiner Brewing Association. In a makeshift brewery, the beginning of Shiner Beer makes its debut as Shiner Premium. 1914... The local brewing association recruits Kosmos Spoetzl as the first brewmaster to bring his Old World recipes and experience to the brewery. 1916... Kosmos begins using glass, returnable bottles to package his brew. 1929... Prohibition takes effect on Jan. 16, 1929 in the form of the 18th Amendment. Known as the “Great Experiment,” the measure makes the manufacture, distribution and sale of all alcoholic beverages illegal throughout the United States. 1930... Despite the restrictions of Prohibition, the “Little Brewery” keeps working making ice and birch beer – sometimes known as “near beer.” This keeps Shiner in business along with the “rumors” that Kosmos continued to produce Shiner Premium for local farmers. 1939... As Kosmos Spoetzl continues his dual roles of brewmaster and head salesman, he ships his Shiner Premium to dock workers in Houston for the first time. 1947... Giving the brewery a facelift, Kosmos resurfaces the exterior in white brick and purchases adjacent land to raise cattle and sheep along with a real menagerie of peacocks, deer and other animals. Aluminum kegs are also introduced during this year of innovation. 1958... The brewery begins using non-returnable, disposable beer bottles for the first time. 1964... Expanding the packaging, the brewery introduces party kegs during the same year that “Miss Celie’s” daughter, Rose, joins the firm. 1966... Miss Celie, the daughter of Kosmos Spoetzl, hires John Hybner, who goes on to be the brewery's longest serving Brewmaster. 1970... Cans are added as an option for Shiner beers. 1971... The brewery is honored with a state historical marker on the site. 1973... Shiner Bock becomes available as a year-round brew. 1989... Shiner establishes a true distribution network, beginning with a Shiner of Austin wholesaler in the Texas capital. Sales double by the end of the year. 1992... fter being distributed exclusively in the Houston, Austin and San Antonio areas, Shiner finally reaches into North Texas “officially.” But this is not locals' first taste of the brew, as it has been “bootlegged” northward for generations. 1994... Shiner Honey Wheat beer is introduced. The successful “Thanks a Million Concert” of the previous year evolves into the first ever Bocktoberfest concert. 1995... Shiner's state-of-the-art brewhouse expansion opens. 1997... In October, the first seasonal product is introduced, Shiner Winter Ale. 1998... The second seasonal brew, Shiner Summer Stock, makes its debut in March and is available in 14 states. Shiner's limited edition, Kosmos Reserve, is retired in December. 1999... The brewery stages its biggest Bocktoberfest in the history of the event, with over 17,000 in attendance! The annual G.A.S.P. (Great Austin to Shiner Pedal) bike rally grows into the Shiner B.A.S.H. The Bike Austin San Antonio Houston becomes the ultimate South Texas pilgrimage to the Spoetzl Brewery. 2001... Shiner's popular Honey Wheat becomes Hefeweizen, and the new brewery Hospitality Room opens. With the closure of the Pearl Brewery in San Antonio, the Spoetzl Brewery becomes the last of the independent Texas breweries. 2002... The Shiner Blonde label gets a facelift. 2003... Shiner Light, the first light beer worthy of the Shiner name, hits the market. And, for those wanting to carry a piece of the “Little Brewery” with them after the tour, the Gift Shop opens in the Hospitality Room. 2005... John Hybner, the longest-serving Brewmaster, retires, and Jimmy Mauric takes over the tradition established by Kosmos Spoetzl 90 years earlier. 2006... For Shiner's 97th birthday, the brewery premieres Shiner 97 Bohemian Black Lager, which like its special edition predecessor, is only brewed from September through mid-December. 2007... Released in May, Shiner 98 Bavarian-Style Amber continues the countdown to the 100th Anniversary of the brewery. 2008... The next anniversary brew in our countdown to the brewery's 100th birthday is introduced. Shiner 99 Munich-Style Helles Lager is unveiled in March. The final limited edition brew, Shiner 100, will culminate these special beers in 2009. Also in celebration of its 99th year, Shiner introduces Spezial Leicht, its first beer with only 99 calories. The city of Shiner, Texas... Deep in the heart of Texas, on a little spot hardly bigger than a postage stamp, sits Shiner, Texas. In fact, you’d miss it if you blinked while zipping by on either US Highway 90A or State Highway 95, where the town sits at the crossroads, off the beaten path between Houston and San Antonio. But, the 2.4 square miles of Shiner, Texas sure packs a wallop! Begun with a 250 acre donation by Henry Shiner as a railroad right of way, the “Cleanest Little City in Texas” now boasts over 2,000 residents and and serves as home to several renowned commercial enterprises, not the least of which is the K. Spoetzl Brewery home of Shiner Beer. But, while Shiner both the beer and the town may be the most recognized name around these parts, we have a number of claims to fame, so if you are in the area, stroll around town, talk to a few locals and don’t forget to have yourself a cold Shiner beer. After all, it’s just not a visit to Shiner without enjoying a Shiner! I'm not a beer drinker, but I do love to cook with beer. If you have any questions or just want to say something that's on your mind, please feel free to send me an email, at christinespantry@gmail.com. If you leave a comment and ask a question please come back for your answer. In large pot, over medium heat, add ground beef, salt and pepper. Breaking meat up as it cooks. Cook meat until no longer pink. Spoon off excess grease. Add remaining ingredients except cheese. Reduce heat, simmer for 30 minutes. Garnish with cheese. Enjoy! Very cool Christine. Great history. I am like you, I don't drink it but love to cook with it. This chili looks amazing. Great recipe! I love the mix of the beer and the chili. Really enjoyed reading the Shiner story, and the chili looks delicious! Glad you enjoyed reading about Shiner Beer. I've been looking for a chili recipe with beer. This looks perfect. 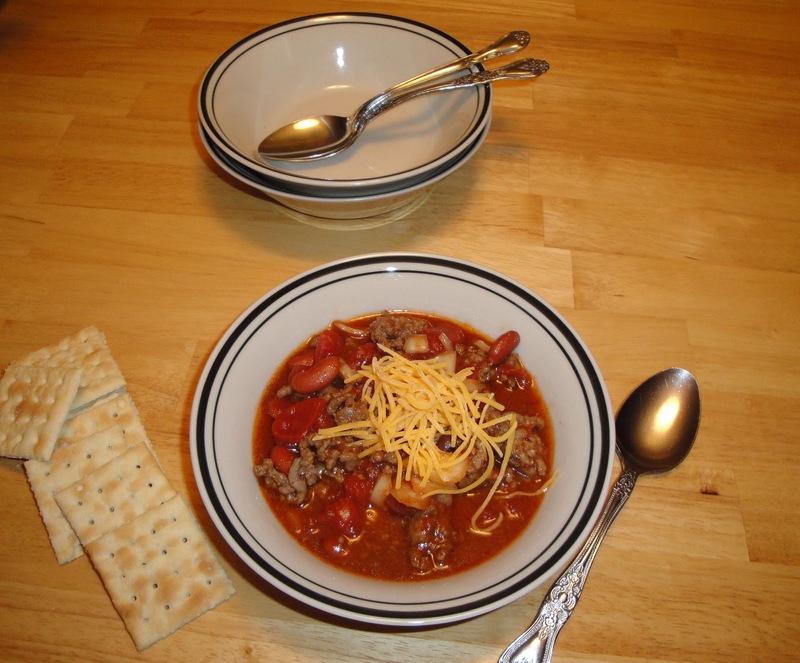 I have printed this recipe, as I want to cook this chili on Saturday. Thanks for the history. I'll let you know how it comes out. Thanks. I have never tried beer in chili. Sounds interesting! I've never tried beer in chili before. Beer goes so well with a lot of recipes, so I thought I would try beer in chili, sure glad I did. It was awesome! Everyone at the table went back for seconds. 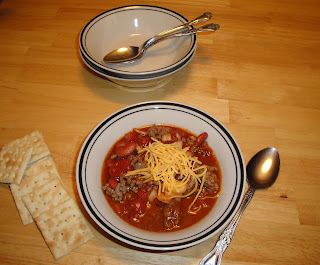 Shiner is my husbands favorite beer and I am sure he would love this chili! Great info on the beer history here. Also very creative use for this beer-Well done. I love cooking with beer to add depth and character to so many dishes, and I just realized I really, really enjoy a little history with my recipes. What a cool thing - thanks so much! I am a beer drinker and I love chili. A match made in heaven! Thanks for sharing the recipe. Chili with beer, so yummy! Oooh, I'll add beer to my next batch of chili! I'm with you--I never drink beer, but I love cooking with it! I am not a beer drinker either. I am sure my husband would love this chilli. Great way to use all the beer in my house. My hubby is a fan. LOL. Reminds me of steaming mussels in butter but it's chili and good for winter!!! Yum! I'm a Beer Advocate (literally — I've almost earned my mug). Though I drink most of my beer, I might just reserve a little to try this recipe. Excellent history, by the way. Well, of course I LOVE this. The Shiner Bock history is really interesting, thanks for posting this. Your chili sounds delicious! I have not tried making it with beer, but I'm sure it would be good. ohhhh, my husband is going to love this! Great post!!!! Hey, we are on the same wavelength all of us! I just made Ann's "Quick Chili" this morning. :) I like the idea of the beer. My hubby will really like that. I'm not much of a beer drinker either, but I do have a few recipes that I use it for. I've tried it in chili! I bet it's delicious! This is a great post, I really enjoyed the history. I am very excited that you have entered you wonderful Chili in The Texas Star Chili Cook Off of 2011. Good Luck with the competition! Beer and chilli, two of my holy food trinity (cheese is the third). Lovely story (am now a follower by the way... Anthony. Thanks y'all. I truly appreciate your comments. Means so much to me. What an interesting bit of beer history! Love the chili recipe too. I started putting a lager into my Ancho Cocoa Chili. I love the depth of flavor that it adds. Thanks for sharing! Congratulations! We wanted to inform you that this post has been selected as a Featured Archive Post on our site for the month of February 2014!